There’s a Lululemon store in my neighborhood, and one of their mottos is “sweat once a day” – now, for the past two days here all you had to do to make this happen is hang around outside for more than 5 minutes, but as anyone who knows me well can tell you, when I decide to do something, I have a tendency to jump into the deep end and do it all the way. We spend so much time trying to control what we look like, what our surrounding temperature is and generally everything around us that we forget our bodies are pretty good at getting the job done and miss out on experiencing each moment for what it is. So if you can manage to shut off that inner adult for a few minutes and just go do something fun until you get sweaty, I’m telling you it feels awesome. Like you’re getting rid of all the toxins or something. Seriously, why do we think it’s so awful to sweat? Our bodies do it for a reason! Sweating decreases our core temperature, and the evaporation decreases our skin temperature. It’s all good stuff, so be grateful we can do it. Of course, drink plenty of fluids and respect your own boundaries. There’s a difference between sweating and getting heatstroke. Another benefit to the class last night? Walking outside afterwards felt downright delicious. 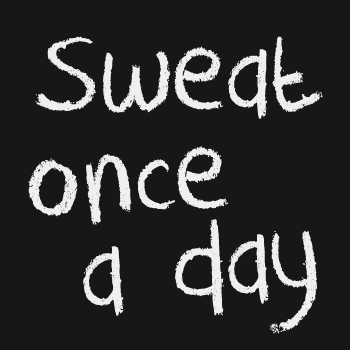 What’s your favorite way to sweat? Posted in thoughts and tagged heat, play, sweat, Yoga. Bookmark the permalink. I'm a writer, web designer, and all-around digital communications junkie. I haven’t been brave enough to try hot yoga (I’m heat sensitive) but I have a few friends who swear by it. I’ll agree with you, its so nice to get outside. I love running at night…its peaceful, quiet, and cool outside. Honestly, I prefer ‘regular’ yoga, normally, but the heat does help with getting your muscles ready to stretch deeper. Hot yoga can be really great, but you absolutely have to be able to let go of your ego sometimes and just listen to your body when it’s telling you to back off and rest while everyone around you keeps going.